Aspiring high school English teacher Jennie Ellis is one of only 16 people selected to participate in an education-focused internship program run by the Museum of Jewish Heritage — A Living Memorial to the Holocaust in New York City. Established in 1998, the initiative, known as the Lipper Internship Program, trains interns to teach young students about the Holocaust and Jewish history. “I’ve always been interested in the subject of the Holocaust,” says Ellis, a junior who is majoring in English and minoring in psychology at Southern. “It’s undoubtedly a tragic slice of human history, yet it’s also marked by bravery and resilience.” After applying to the internship program in 2012, the Ansonia resident was chosen to begin the program in fall 2013. The internship is open to undergraduate and graduate students who attend school in Connecticut, New Jersey, New York, Massachusetts, Pennsylvania and Rhode Island. “From the beginning, we knew it was important, as an educational institution, to offer a meaningful internship program to those interested in Holocaust education and history,” says Betsy Aldredge, director of media relations for the museum. The internship runs for an entire semester, beginning with a two-week training period that includes studying the museum’s exhibitions, attending seminars led by Museum of Jewish Heritage scholars and meeting Holocaust survivors. Ellis says the training was overwhelming at first, but the program coordinators were very helpful. Listening to the personal accounts of three Holocaust survivors and a survivor of the Rwandan Genocide was a powerful experience, she adds. The first account she heard was particularly moving, says Ellis, recalling Sally Frishberg’s vivid description of hiding from the Nazis. Now that her training is complete, Ellis and the other interns bring groups of middle and high school students to the museum where lessons are integrated with tours of the exhibitions. She also shares her knowledge with schools in Connecticut through presentations on Jewish heritage and the Holocaust. Ellis says she had a very positive experience at New London High School, where she taught five classes of freshman students. She is also scheduled to teach at High Horizons Magnet School and James J. Curiale School, both in Bridgeport; Windham High School in Willimantic, and Integrated Day Charter School in Norwich before completing the internship in June. Published April 17, a few days before the April 22 celebration of Earth Day, the 216-page guide is the only free comprehensive resource of its kind: it can be downloaded at www.princetonreview.com/green-guide and www.centerforgreenschools.org/greenguide. The Princeton Review created its “Guide to 332 Green Colleges” in partnership with the Center for Green Schools (www.usgbc.org) at the U.S. Green Building Council (USGBC). The 322 school profiles in the guide feature essential information for applicants – facts and stats on school demographics, admission, financial aid – plus write-ups on the schools’ sustainability initiatives. A “Green Facts” sidebar reports on a wide range of topics from the school’s use of renewable energy sources, recycling and conservation programs to the availability of environmental studies and career guidance for green jobs. Robert Sheeley, associate vice president for capital budgeting and facilities operations, said that Southern’s inclusion in the guide is “great news for our University” and represents a “great team effort.” He praised the dedication of campus Sustainability Coordinator Suzanne Huminski. Franek noted his Company’s recent survey findings indicating significant interest among college applicants in attending “green” colleges. “Among 10,116 college applicants who participated in our 2014 ‘College Hopes & Worries Survey,’ 61% said having information about a school’s commitment to the environment would influence their decision to apply to or attend the school,” he said. The Center for Green Schools at USGBC is making sure every student has the opportunity to attend a green school within this generation. From kindergarten to college and beyond, the Center works directly with staff, teachers, faculty, students, administrators, elected officials and communities to drive the transformation of all schools into sustainable places to live and learn, work and play. For more information, visit centerforgreenschools.org or find us on Twitter and Facebook. The U.S. Green Building Council (USGBC) is committed to a prosperous and sustainable future through cost-efficient and energy-saving green buildings. USGBC works toward its mission of market transformation through its LEED green building program, robust educational offerings, a nationwide network of chapters and affiliates, the annual Greenbuild International Conference & Expo, the Center for Green Schools and advocacy in support of public policy that encourages and enables green buildings and communities. For more information, visit usgbc.org, explore the Green Building Information Gateway (GBIG) and connect on Twitter, Facebook and LinkedIn. *Deputy Chief of Police Phil Pessina was highlighted in an April 24 article in the Hartford Courant about receiving the Middlesex Chamber of Commerce Michael L. Green Award for outstanding community service. Phil has been very active in the Middletown community, serving in its police department for 33 years before coming to Southern. He also has served as a member of the town’s common council, as well as volunteering at community events. *The April 7 forum, “Crisis in Ukraine: What Happened and What’s Next?” generated a plethora of recent news coverage. The event drew about 250 people, including about 100 high school students from classes at 4 area high schools. CT-N (Connecticut Network) aired the program several times in its entirety, starting on April 9. The New Haven Register ran an article in the April 15 paper about the forum. Channel 61 had aired a 2 ½-minute segment several times during its morning news show on March 31 to preview the forum. The piece included interviews with Greg Adams, chairman of the Sociology Department, and Kevin Buterbaugh, professor of political science. Greg and Kevin also were interviewed recently on WNPR’s “Where We Live” talk show on March 20. The forum was mentioned several times during the broadcast. Kevin was interviewed on WTIC (1080 AM) on April 2 and WATR (1320 AM) on March 28 about the situation in Ukraine with a connection to the forum. Greg was interviewed March 31 on WQUN (1220 AM) about the crisis in Ukraine with a connection to the forum. The Connecticut Post ran a short article that previewed the forum. 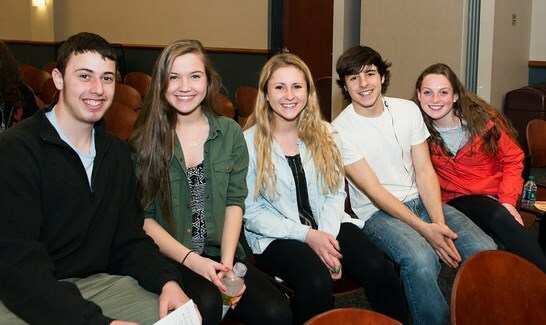 And the Danbury News-Times ran a post on March 20 in its blog, “Off Beat” that previewed the event. In addition, the SCSU blog, “Wise Words,” includes a post about the event with several pictures. *A preview of a comedy show at Southern by Brad Sherwood and Colin Mochrie ran in the April 11 edition of the New Haven Register. *A column by Randy Beach ran April 13 in the New Haven Register about the recent visit to Southern by Billy Collins, a former U.S. poet laureate. The visit – which included readings by the poet – was held April 9. *Abbey Pantani, an officer in the university’s Police Department, was interviewed April 10 onChannel 8’s “Connecticut Style” program about the April 23 Jail N’ Bail event on campus. *The work of Dana Casetti-Dinescu, assistant professor of physics, was highlighted in anarticle published April 4 in Scientific American, a prestigious science magazine. Her work focuses on how gas from two nearby galaxies (Magellanic Clouds) that orbit the Milky Way Galaxy has collided with gas from the Milky Way to create new stars. Fans Who Celebrate Victories with Violence, Vandalism — Why? Your favorite team has just won the championship game. You join with your fellow exuberant fans in celebrating the victory. High fives are exchanged. Chants are voiced. Perhaps a victory party is in the works. At least that’s the way the overwhelming percentage of die-hard fans rejoice in their team’s triumph. But for a select few, the normal celebratory practices are not enough. Instead of rehashing the game and chatting with their friends, they resort to tipping over cars, or worse, setting them on fire. 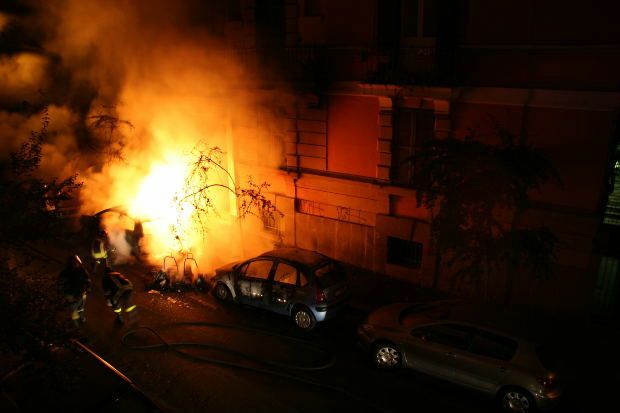 Instead of a festive night on the town, they opt to riot in the town. Instead of popping the cork of champagne, they pop the windows of nearby establishments or vehicles. 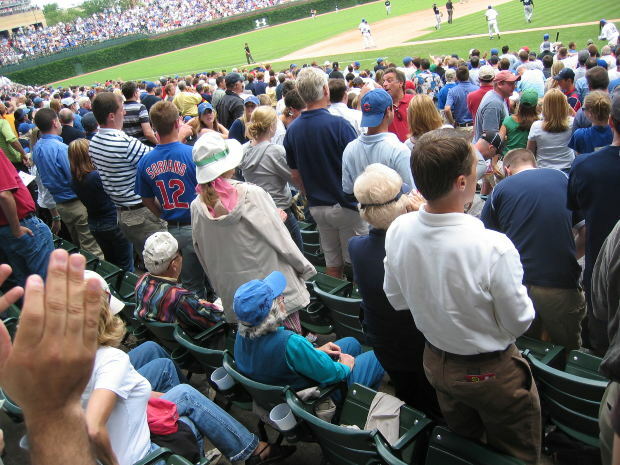 The vast majority of sports fans can be counted on to behave properly during and after a game — win or lose. Why do some people resort to this kind of behavior when their team has just reached the pinnacle of success? Granted, losing fans sometimes resort to this behavior, too. High doses of anger, frustration and disappointment can be a recipe for violent behavior. And that’s just as disturbing. But from a psychological standpoint, the “victory violence” is more of a mystery. What exactly about the thrill of victory sets people off? Yet a small number of ‘fans’ paradoxically resort to violent behavior, such as vandalism and setting fires, after their team wins a national or international championship. The jury still appears to be out on this phenomenon, sometimes known as sports hooliganism. Bessenoff says that while the number of people who engage in this type of behavior is small, it is large enough so that it has become a regular scene after college and professional team sports championships. And it doesn’t seem to matter what part of the country the team is from. In fact, soccer — with its international flavor and national pride on the line – is ripe with such incidents around the globe. Some point to the release of large amounts of testosterone after a big victory – especially for fans who take wins and losses personally – and speculate that it can lead to more aggressive behavior. Others theorize championships can create a sense of euphoria in which a sense of invincibility sets in. But nobody really knows for sure. Not yet, anyway. “There is some research on the subject, but it’s still not very well understood,” says Sharon Misasi, a professor of exercise science at Southern who has a background in sports psychology. She recommends a 2007 article posted on the BBC website for those who wish to read more on the subject. Southern honored 11 faculty members recently during the university’s first “Celebration of Excellence” event. The program featured presentations to those faculty members who have been selected as recipients of various university awards. Previously, the awards were presented at several functions, but for the first time, those awards were presented in a single ceremony. President Mary A. Papazian congratulated the honorees for their hard work and devotion to their students. She noted that the awardees are generally selected by their peers. “To be recognized by your peers is sometimes the most valuable recognition you can earn,” she said. Faculty, staff and students greeted the award winners and all were treated to a buffet lunch. Beck has just published a book of poetry, Blinding Light, which she says was initially inspired by the Strozzi painting. After seeing the painting, she researched it on the Web, but only found explanations saying the Madonna represented the law of the Old Testament. Beck disagreed. “I decided it was the law of mothers,” she says. “She’s got a baby and a book.” As a lawyer who is also a mother, Beck was intrigued. She became interested in the notion of Mary and the law of mothers, what Beck calls “Lex Maturnus.” Yet “I knew I wasn’t going to write a book just about Mary,” she says. “I had to bring her down to my level. I had to think about the concerns of all mothers, about loving a child and not knowing what is going to happen in that child’s life.” The Strozzi painting poem was the first she wrote that is in her book, but the poem, like her ideas about the painting, evolved over time. Beck wrote many of the poems as a student in Southern’s M.F.A. in creative writing program, and the book is a shorter version of her thesis. She graduated in 2013 and since then has been teaching creative writing at Southern and literature at the University of Hartford, where she taught law for nine years and later chaired the paralegal department. Her practice of law lasted more than 20 years, and during that time, she says, she was not thinking about writing poetry. But after leaving the legal field, she began to write and eventually decided to enter Southern’s M.F.A. program. Many people say students today are more aware of the world around them than at any time in history. The technological boom in the 21st century – where news of events happening thousands of miles away can be reported instantaneously via social media – certainly helps make that a plausible argument. We saw evidence to support that theory in our own backyard this week as social studies classes from four area high schools attended an April 7 forum at Southern called, “Crisis in Ukraine: What Happened and What’s Next?” The latest developments in the standoff between Ukraine and Russia – and between East and West — were the focus of a panel discussion. Panelists at Southern’s forum on Ukraine ponder a question from moderator Chris Velardi (far left), a news anchor at Channel 8. 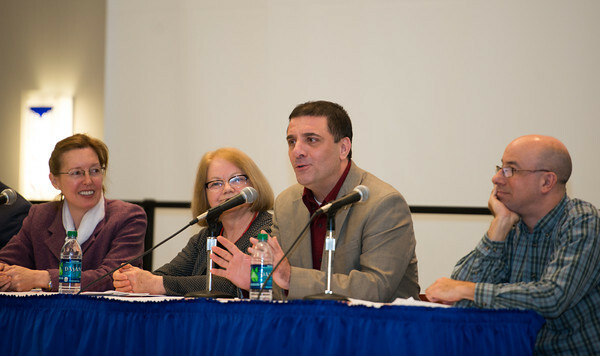 Faculty experts representing a variety of disciplines and perspectives shared their views and insights. 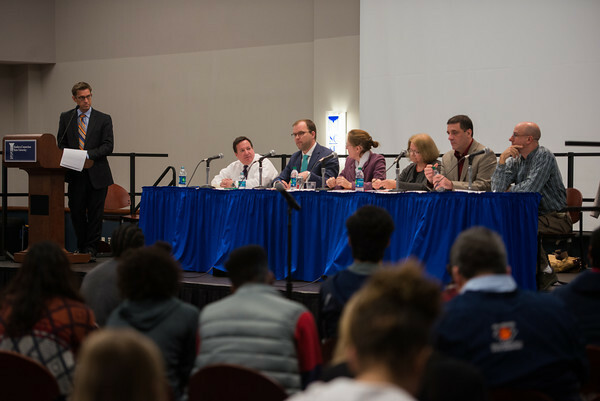 The panel discussion included a look at what the United States can and should do in response to the Russian annexation of Crimea, as well as with the threat of further territorial encroachments. Costel Calin, an assistant professor of political science at Southern, gives his assessment of the situation in Ukraine. The high school contingent – representing Amity High School of Woodbridge; Shelton High School; and Hillhouse High School and Sound School, both from New Haven – totaled about 100 students. In all, about 250 people attended, which also included college students (mainly from Southern), faculty, staff and some individuals from the general public. 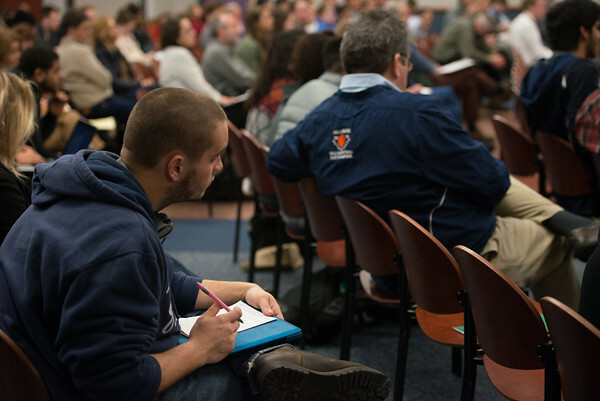 A Southern student takes notes during the panel discussion. But it wasn’t a matter of a few teachers forcing their classes to sit through a college program. The students generally and genuinely seemed excited to be with us and were attentive to the discussion. In fact, a few teachers told us beforehand that the students had been discussing the situation in Ukraine in their classes and were eager to attend the forum to learn more about what is happening. To be sure, any group of 100 high school students is likely to include a few who wished they could be somewhere else. Of course, that’s true of adults, too. But by and large, their behavior and enthusiasm was impressive, especially at a time when young people are often criticized as having a short attention span. Most listened intently during the 1 hour, 45 minute program as the professors enlightened and opined. These Amity High School students are enjoying their trip to Southern. In fact, many of the Shelton High School students were continuing the discussion after the program’s conclusion, according to their history teachers Sharon Cayer and James Allan. Hillhouse High School students are eager for the program to start. Adams was part of the six-person panel that also included: Kevin Buterbaugh, SCSU professor of political science; Patricia Olney, SCSU professor of political science; Krystyna Gorniak-Kocikowska, SCSU professor of philosophy; Costel Calin, SCSU assistant professor of political science; and Matt Schmidt, assistant professor of political science and national security at the University of New Haven. In addition to Sharon Cayer and James Allen from Shelton High, the teachers whose classes attended included John Buell from Sound School; Jack Paulishen from Hillhouse; and James Clifford, Chris Borelli and Lee Ann Browett from Amity. Sound School students are among the first to arrive for the forum. If you would like to see the program in its entirety, you can check it out thanks to the Connecticut (Television) Network – CT-N.
For college students, the first few weeks after completing the spring semester is often a time to catch their breath, return to the comforts of home and get ready for a Memorial Day picnic or two. But that won’t be the case this year for Krystina Morgan, a sophomore at Southern, who has volunteered to help impoverished South American children as part of the Cruz Blanca program. The Ansonia resident will be trading in the temperate late spring Connecticut weather for the late Peruvian fall. Instead of relaxing at a beach, she’ll be working with hammers and nails to build houses for poor families. And forget about the comforts of home – her nightly accommodations will be a sleeping bag on the floors of families she is trying to help. Morgan, who will be stationed in Lima with about a dozen other Connecticut residents taking part in the program, will be helping children who usually get just one meal a day. Cruz Blanca is a Peruvian non-profit charity that provides campus and other activities for poor children from the shanty towns of Lima, Peru. Children attend the camps throughout the year. The May 22 to June 1 trip is being coordinated by Sister Gabriella DaVilla, a religion teacher at St. Joseph High School in Trumbull who taught Morgan in her senior year. She has remained in contact with her former teacher and might have gone on the trip to Peru last year, but it coincided with a vacation she had already planned. Morgan, a journalism student who would like to go into the broadcast news field, can often be found working in the campus bookstore when she is not in class. A group of nine nursing students at Southern flew to Jamaica last month for their spring break. But unlike many of their college peers, these students didn’t get a chance to spend much time on a beach, taking a break from the rigors of academic life. Instead, they volunteered their time alongside Jamaican healthcare professionals to assist at various medical and care centers. Antoinette Towle, an assistant professor of nursing who teaches the class “Understanding Global Healthcare,” visited Jamaica with her husband to do a trial run shortly before the trip with her students. “I was amazed at the lack of healthcare and how one can leave these beautiful resorts and beaches to find a third world country in the midst of all this wealth,” says Towle, who is also an APRN. The trip marked the Nursing Department’s first educational trip outside the United States. The objective of the course is to offer nursing students an opportunity to study within a culturally diverse and vulnerable environment. At the beginning of the trip, she prepared the students for the long, rigorous days of working in the field by participating in challenging team-building exercises. “We went to Dunn’s River Falls and climbed the 950-foot waterfall as a group,” says Nicole Valeriano, a junior from Stratford. The students observed the Jamaican medical professionals at work, but they also provided assistance with checking patients’ vital signs and performing general health assessments. Visiting the Jamaican countryside induced a bit of culture shock for the students, as the local nursing home was a “big ward instead of individual rooms,” and a vast majority of the natives walked around barefoot and had no access to running water, creating some unsanitary conditions, according to Towle. Some of the patients were amputees, the consequences of uncontrolled diabetes. The students also volunteered at a children’s hospital in the capital city of Kingston, where they saw patients who suffered from asthma and chicken pox. “The children were so kind and were so happy to see us that (we) really felt like just (our) presence was changing their lives,” Valeriano says. In addition, the nursing group volunteered and brought toys, coloring books and reading books to children at, “Fellowship Hall,” a one-room schoolhouse in the Parish of St. Mary. Preston Briggs and Melina Raucci, juniors from Old Saybrook and North Branford, respectively, said the children were animated and seemed to appreciate the group and gifts. “We were attacked with hugs the second we walked into (the school),” Raucci says. Towle says she developed a great appreciation for the positive demeanor of the Jamaican people, and was very moved by their warm and welcoming manner once they became familiar with the Southern nursing class. Raucci says she also was impressed by the upbeat attitudes of the local people, despite the seemingly underprivileged conditions in which they lived. As a teacher, Towle’s favorite part of the trip was watching the students’ perspectives transform throughout the week, as they went from seeing “the big, stark buildings with no windows,” to valuing and understanding the people. Regardless of the tropical weather and beautiful resort, Valeriano said the trip changed her life by giving her a greater appreciation for the opportunities and cleanliness in the United States, and changed her perspective on mission trips. “I look at people differently now and will take my experience with me wherever I work,” she says. © 2016 Southern Connecticut State University.